Woodcarving reproduction study casts are high quality, extremely realistic and durable urethane castings molded from original woodcarvings by three time World Champion Fish Carver Clark Schreibeis of Montana. They can be used for decorative purposes, painting practice or as study casts. Clark originally made these casts for his fish carving workshop students, but they have become so popular that he is now offering them to everyone. These casts are one-sided (they are flat on the back), so there are no casting part lines, seams, or flaws. Therefore, almost no prep work is required for painting. 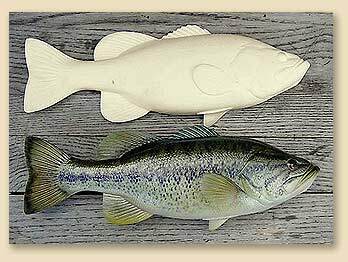 They are a great way to see how Clark carves and textures his fish, or you can paint 'em up and sell them in your shop as decorative gifts.